Do you want to insert your SIM card in iPhone? You are probably confused about how to and where to insert a SIM card to your iPhone because each avatar of iPhone, the iPhone 4, iPhone 4S and iPhone 5 uses a slightly different type of SIM and the procedure to insert the SIM in iPhone also depends upon its version. The standard size of a mobile SIM card is 25×15 mm, but the Apple iPhone4 and iPhone 4S uses the Micro SIM which is 15×12 mm in size. 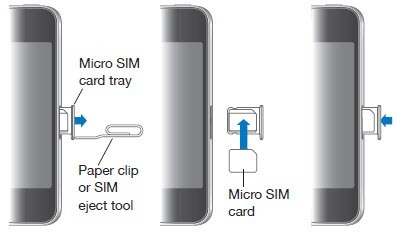 If you don’t know know how to create a Micro SIM card, please see this guide on cutting a normal SIM to create a Micro SIM and Nano SIM card. Please follow the guide very carefully as you may destroy your SIM if you make a mistake. The best options is to ask your mobile service provider for a micro SIM for iPhone. Assuming that you have the Micro SIM card, here’s the procedure to insert the SIM card in iPhone 4. 1. First take a paper clip and make its wire straight. 2. Locate the SIM tray in the right side of your iPhone 4 or iPhone 4S. Insert the straightened paper clip in the small hole and press it. The tray will automatically pop out. Just pull it out completely. 3. Now place your Micro SIM card in this SIM tray. Make sure that the golden circuit side of SIM is facing downwards and that it fits perfectly in the tray. 4. Now put the tray back into its slot. Press it until your hear a click sound. 5. That’s it. Now iPhone will automatically recognize the SIM card. iPhone 5 is one of the thinnest mobile phone available today. It has a thickness of only 7.6mm. Creating a thinnest mobile is not easy and the hardware has to be changed completely to make this a reality. One significant change from end user’s perspective is that the iPhone 5 uses a nano SIM. If your mobile phone service provider doesn’t provides the nano SIM for the iPhone 5, you can follow the link posted above to cut a normal SIM or a micro SIM to a nano SIM. There is only one issue while converting, its very difficult to change the thickness of the normal or micro SIM to make it a nano SIM. You can try to do it yourself, but its best to wait for your mobile service provider to provide the nano SIM. Once you have the nano SIM card, the procedure to insert the SIM card in iPhone 5 is exactly same to that of iPhone 4 and iPhone 4S (see above). If you have any questions related on how to insert SIM card in in iPhone 4, iPhone 4S or iPhone 5, you can post it here using the comment form below.